Two Bears Farm and the Three Cubs: Our Elf on the Shelf is Defunct! 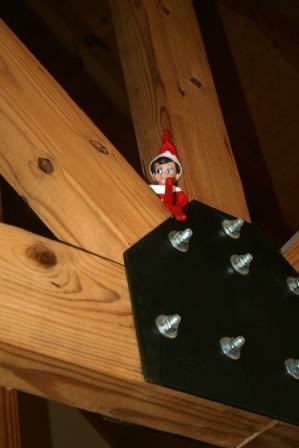 Our Elf on the Shelf is Defunct! 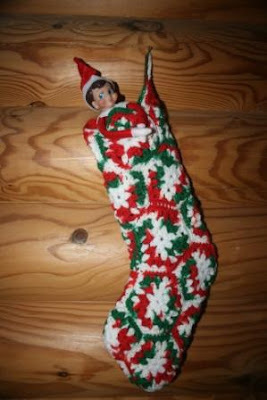 Like just about everyone else with kids under the age of 18, we started the Elf on the Shelf tradition last year. Only we seem to have gotten a bad elf. The legend says that the elf is supposed to fly to the North Pole every evening to report to Santa, and then return before daylight in a new location. Our elf, Tulley? Downright lazy. In fact, he doesn't seem to bother flying to the North Pole half the time. And then I get a lot of questions when a certain 5 year old wakes up to find Tulley in the same spot as the night before. Mom, why is Tulley still there? Uhhhhhh....maybe he has a cold. Yes, he couldn't fly to the North Pole last night because he was sick and needed to rest. See how his cheeks look a little flushed? Is he okay?!?! Mom, how will he get up there if he's sick?! Well, I'm sure Santa will send him some magic to make him feel better. But if Santa can send him magic why didn't he go see Santa last night? No good, low-lying elf. See what he is putting me through? Just this ONE LITTLE THING. Is it too much to ask the he remember to relocate each evening? Ah, that's better. Watch out Tulley. If you don't stop loafing on the job, we may have to return you for a new elf. I've heard elf competition is pretty stiff these days! I tell you its hard to find a good elf theses days!! LoL...what a great fun tradition. My youngest would love that. ha : ) we haven't put fred charles out yet ..... for the realistic possibility of that sort of thing happening over here a lot too : ) i always enjoy seeing pics of your house, it's so beautiful, spacious and cozy looking. If I found a nice warm stocking, I would want to stay there too. What a cute tradition! I had never heard of it before. We have been complete dropouts with the elf on the shelf this year. I had the book out but then used it to take some photos...and now can't find it. So while we have the elf, I think we are going to pass on it this year. It makes me tired just thinking about doing it all :). oh my goodness, this was the funniest thing i've read so far today!!! thanks, lisa!!! what a crackup! I thank God we never went there. No elf here. How funny! And the elf competition is stiff! Gosh, I have never seen so many Elf On The Shelves in all forms, along with the books and DVD's everywhere. Would you believe I had never heard about this till this year? I never saw any elf stuff in the stores till now, either. I watched it with Ella the other day. No wonder he was sent away from the North Pole. He was likely not pulling his weight there either! What a fun tradition! For the kids, huh?! Maybe not for Mom! Too funny! I would have a hard time remembering to relocate him every night AND coming up with a story if I forgot! Good luck! Huh! I've never heard of this tradition before! I'm so worried that I'll be that forgetful tooth fairy. This just seems like one of those things, if we adopted this tradition, I might crush the imagination and spirit of my littles by being forgetful. Ha! P.S. I'm a runner too! Haha! We've had the same problem. Though currently our elf has temporarily returned to the north pole due to unacceptable children behavior. LOL! The "tooth fairy" didn't always show up when she was supposed to at our house. Oh the questions I had to answer in the morning! Would it be funny for me to say that I find the whole elf on shelf thing to be a little scary?! Thinking about this doll starring at me like that, all day long...I can't imagine I'd enjoy it but I'm sure the boys and their daddy would get a kick out of it. The Captain for hiding it and the boys for having to find it every day! Lisa, Check out Pinterest.com for lots of ideas...last night ours toilet papered our tree! Bad Elf!! But you can always use the "he must have really liked that spot to go back to it!" OR "the conditions were good for late night travel to the north pole"
Never did this but it sounds like a lot of fun. When I was a kid my mom had an elf that would move around like that and report to Santa. His name was Pappy. I have him somewhere. I hope to find him soon. That is if my husband will get off the computer and get a move on getting the boxes and boxes of Christmas stuff that I have in the attic down. Time is a ticking you know! Do you know that I was named after a Christmas Elf? And,,, the elf brought jammys every Christmas Eve. And I know Santa has magic bubbles so he can send magic bubbles to get the elfy. I have magic bubbles too - did you know that? They are part of my world, cause I believe in magic! YOu crack me up!! Your elf on the shelf is terrific. YOu should link up tomorrow night because this definitely qualifies for a Saturday laugh! Haha!! Love this!! That sounds like something I'd do (or not do)...I'm not so good at night and having to remember things like moving the Elf. I think I'll jump on the bandwagon and get this next year. Oh, I'd never remember to move the thing, either! Heck, I can't even remember to have them pull off a link of their Christmas count down chain.... I think we're still at 3 weeks until Christmas? Your post had me LOL'ing!! I have Tully's brother at my house. Clearly they were born with the same slacker genes! 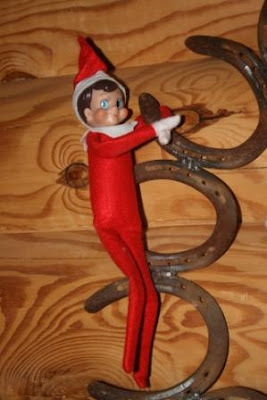 I forgot about the elf on the shelf! WE totally need this in our house lately - Deaglan is definitely on Santa's naughty list. I'm going to copy you and start using the elf immediately.